September is National Coupon Month, but every month is coupon month with me because it pays off! Coupons do not always require clipping! 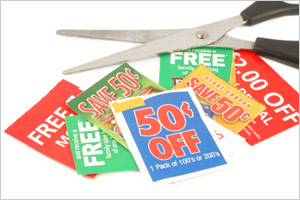 Many digital and mobile coupons put discounts in consumers’ hands. Purchasing power with coupons adds up. Researchers found the average family can save from $500-$1000 each year simply by incorporating coupons into online and in-store purchases. Even if you don’t want that extra cash for a great vacation every two years, stashing the savings away at just 5% will return nearly $40,000 after 20 years! One of the easiest ways to save money is connecting with your family favorites online. For example, one of my favorite brands, Prairie Farms Dairy, can send coupons to your inbox. The convenience is not the only reasons I like the Prairie Farms family of products. Prairie Farms represents over 700 farm families and their distribution system covers over 30 percent of the United States! Plus Prairie Farms charitable giving program, Our Caps, Your Cause, supports a variety of non-profit organizations enabling consumers to save money and support their favorite causes while enjoying dairy products free of artificial growth hormones. The “Our Caps, Your Cause” program gives consumers a say in where the donations go. Learn more about Prairie Farms coupons at their website prairiefarms.com. This entry was posted in Uncategorized and tagged “Our Caps, coupons, dairy products, Danita Blackwood, National Coupon Month, no artificial growth hormones, Prairie Farms Dairy, Saint Louis, Your Cause” by Danita Blackwood. Bookmark the permalink.